New Look Cleaning will begin cleaning the exterior windows on Thursday, June 7th – Monday, June 12th. They will have a large lift onsite for this work. Thursday/Friday: They will start on the S. side of the building and work their way around to the W. alley side. When working on the alley side they will block off only part of the alley at a time. The parking garage will still be accessible. Saturday/Sunday: They will clean the N. and E. side windows. For questions or concerns about how this may impact your area, contact Melinda Seeley, Campus Planning and Facilities Management (CPFM) Campus Planning at 346-5550. On Thursday, June 14th, from 1:00 pm until 5:00 pm, building heat will be impacted, and may be a few degrees cooler, while leaks are repaired in the 2nd floor corridor. This will briefly affect the whole building, and then specifically rooms 261, 270 and 270F while repairs are made in each. Work will be performed by GBC Construction. 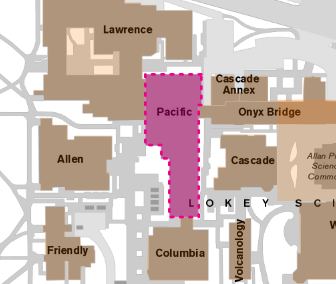 PeaceHealth will be replacing the sidewalk along Hilyard as it crosses the Alley entrance to the CMER building. The work will begin on Friday, June 1st and should be completed by Monday, June 4th. 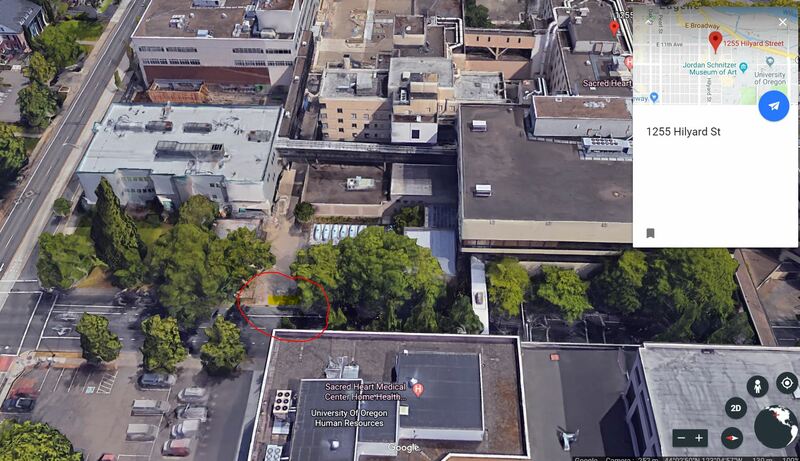 The East end of the alley and the CMER Access off of E 11th will remain open. The elevator shutdown has been rescheduled for this Wednesday, May 2nd, at the same time. We are still waiting for parts to arrive. On Wednesday, May 2nd , Monday, April 30th, from 7:00 am to 9:00 am, elevator #1 will be shut down for repairs. Work will be performed by an OTIS Elevator technician. For questions or concerns about how this may impact your area, contact Rob Berg, Campus Planning and Facilities Management (CPFM) Electrical and Light Supervisor at 346-2313. 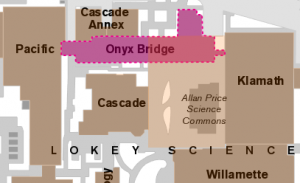 Beginning Wednesday, April 11th until Saturday, April 14th, the exterior windows of Onyx Bridge will be cleaned. Work will be performed by DDJ Window Cleaning. For questions or concerns about how this may impact your area, contact Kevin Farthing, Campus Planning and Facilities Management (CPFM) Environmental Services Associate Director at 346-2857. Update: RO water pipe has been repaired. We are having to do an emergency repair to the RO (reverse osmosis) water line. Since the RO water is pulled from tanks, we are hoping this will not affect the building users prior to the problem being corrected. We will let you know when the repairs have been completed. Campus Planning and Facilities Management crews will be performing the work. For questions or concerns about how this may impact your area, contact David Ward, Campus Planning and Facilities Management (CPFM) Building Systems Associate Director at 346-2303. 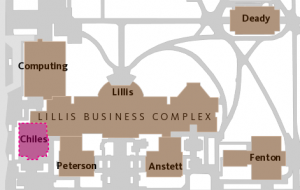 Starting Thursday, April 5th, 2018 at 6:00 am and ending Friday, April 6th, 2018 at 6:00 am (24 Hours) the supply air will be down for the east portion of the Huestis Hall, on all floors, to replace a fan/motor assembly in supply fan SF2. For additional questions or concerns on how this may impact building services, please contact CPFM Facilities Services Zone B Maintenance Manager Bruce Budzik 541-346-8834. 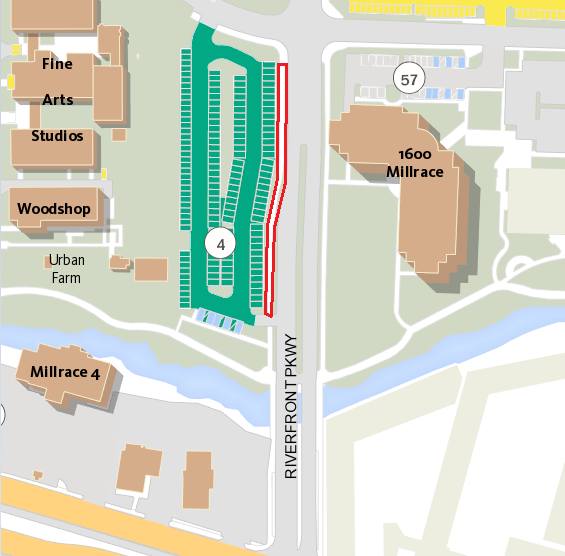 Effective immediately on Monday, March 19th, the sidewalk in front of parking lot #4 will be shut down due to an extreme trip hazard. This is located on the north side of Franklin Blvd., on the west side of Riverfront Pkwy. This closure is expected to last part of the day until a temporary fix can be put in place. For questions or concerns about how this may impact your area, contact Kevin Farthing, Campus Planning and Facilities Management (CPFM) Zone D Maintenance Manager at 346-2857. UPDATE: The power has been restored but the elevator will continue to be down until Thursday, March 8th, when new parts are scheduled to arrive. The power went out early this morning in Columbia Hall, and CPFM crews are currently working to get it back online. We will update you as soon as the power has been restored. For questions or concerns about how this may impact your area, contact Bruce Budzik, Campus Planning and Facilities Management (CPFM) Zone B Maintenance Manager at 346-8834 or Rob Berg, Campus Planning and Facilities Management (CPFM) Electrical Supervisor at 346-2313. This notice has been sent to all building users: SRC, Straub, LLC, Earl, Bowerman and Housing. This notice has been extended through February 23, 2018 ending at 12:00 (noon). The sidewalk will remain closed for the duration of the work. Please expect noise from the stump grinder between 9:00 am – 12:00 pm (noon) on the 23rd. Work will be performed by Long Tom Sawmill. For questions or concerns please contact CPFM Facilities Services Arborist Becket DeChant at 505-699-7007. 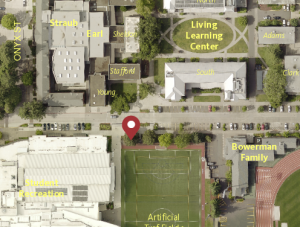 On Thursday, February 22nd, from 8:00 am until 2:30 pm, the south side of Straub, SRC, and LLC may be impacted by noise related to the removal of a Norway Maple tree. 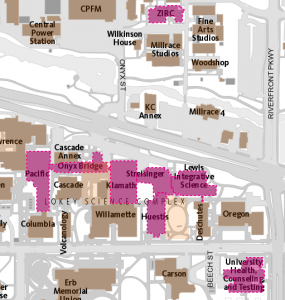 Sidewalk access to the Student Rec Center from the east sidewalk on the south side of E. 15th will be closed, and East 15th Avenue will have periodic restrictions by trucks loading debris. Old injuries to the trunk coupled with irreversible root rot fungus has resulted in the large cavity at the base of this tree. This development, when considered with the weight of the canopy above and the high traffic nature of the site necessitates its removal for pedestrian safety. The site will be re-planted in consultation with campus designers. 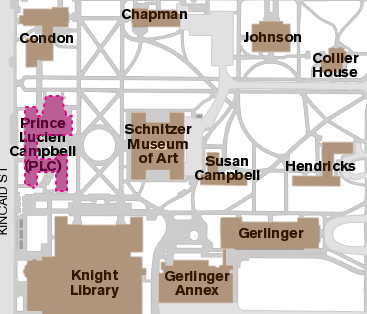 Work will be performed by Campus Planning and Facilities Management crews. For questions or concerns about how this may impact your area, contact Phil Carroll, Campus Planning and Facilities Management (CPFM) Grounds Maintenance Manager at pcarroll@uoregon.edu. Date Revision: The date has been pushed back to Monday, February 19th. 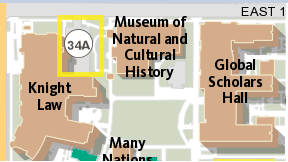 On Thursday, February 15th Monday, February 19th from 7:00 am until 4:00 pm, the Knight Law Parking Lot 34A will be closed. 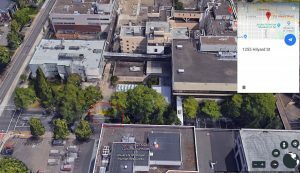 A crane will be used to do some electrical work on the roof of the law school. Work will be performed by Scofield Electric. For questions or concerns about how this may affect your area, contact Glen Macdonald, Campus Planning and Facilities Management (CPFM) Design and Construction at 346-2281. 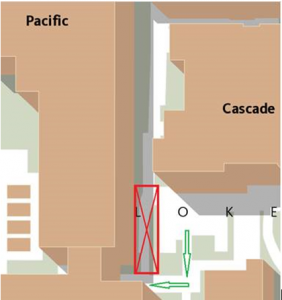 Beginning today, Monday, February 5th, at 3:00 pm until Wednesday, February 7th, at 3:00 pm, the walk path between Cascade Hall and Pacific Hall on the south side will be re-routed. 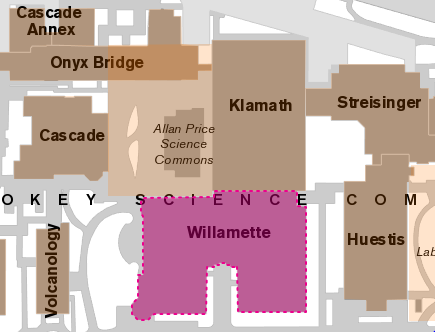 Pedestrians will have to walk past the fountain to get to the breezeway between Pacific and Columbia from Cascade. 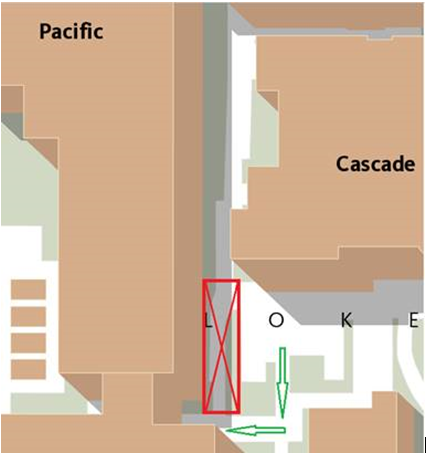 This temporary detour is needed while the windows are being resealed on the east side of Pacific Hall. Work will be performed by a contractor. For questions or concerns about how this may impact your area, contact Bruce Budzik, Campus Planning and Facilities Management (CPFM) Zone B Maintenance Manager at 346-8834. On Saturday, February 17th, from 6:00 am to 3:30 pm, construction activity will shut-down heating water to Oregon Hall 2nd Floor East and 4th Floor East. 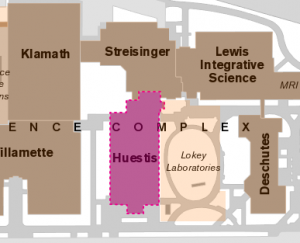 The 2nd and 4th floor east areas will be without heat during the shut-down and there will be workers in the space to drain down the heating water system, recharge, and remove air from the system. This work is required to support the renovations on the 2nd Floor to remove old hydronic piping and add isolation valves in the new 2nd Floor Mechanical Room. Work will be performed by Fortis Construction / Hydrotemp Mechanical. For questions or concerns about how this may impact your area, contact Patrick Mucker, Campus Planning and Facilities Management (CPFM) Design and Construction at 346-8216. Onyx Bridge fire alarm repairs have been completed and are scheduled to be tested on January 30th, from 6:00 am until 7:00 am. Horns, Strobes, and Speakers on the fire alarm system will not sound after the scheduled time, but there may be an activity such as door holders closing and smoke detector testing that will occur throughout the morning. 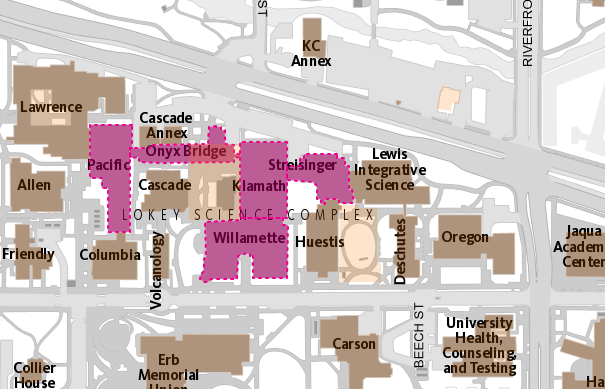 Provisions have been taken to monitor the building fire systems during this time and alarms that occur after the scheduled time should be considered real events and occupants should evacuate as usual per the U of O Emergency Procedures. 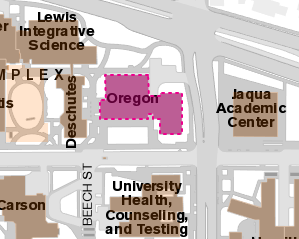 If there are questions regarding emergency evacuation, please visit Emergency Management & Continuity, http://emc.uoregon.edu/node/50 and follow the UO Campus Emergency Procedures Manual. You may also contact Fire Systems Program Manager Zach Earl with Safety and Risk Services at 541-346-9295 if you have any questions or concerns. On Wednesday, February 7th, from 8:00 am until 3:30 pm, scheduled preventative maintenance will cause intermittent shutdowns on air handling units and restroom exhaust fans while system filters are changed. Work will be performed by CPFM crews. For questions or concerns about how this may impact your area, contact Jim Cody, Campus Planning and Facilities Management (CPFM) Zone A Maintenance Manager at 346-2302. 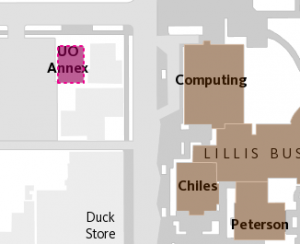 As part of Oregon Hall Renovations, we will be decommissioning electrical equipment in Mechanical Room 334 on Wednesday 2/7 at 6AM. Some equipment will be repurposed and be brought back on-line Wednesday 2/21. We will be providing temporary power to some network equipment and Fire Alarm equipment during this period. Work will be performed by Fortis Construction and JKG Electrical. Please contact me if you encounter any electrical issues during this period. I can be reached at pmucker@uoregon.edu, or 346-8216. On Saturday, February 3rd, from 8:00 am until 3:00 pm, the heating water will be shut down on the 2nd level to repair heating water connections within the newly remodeled areas. Indoor temperatures will be cooler by approximately 10′ F. This will affect the entire 2nd floor. 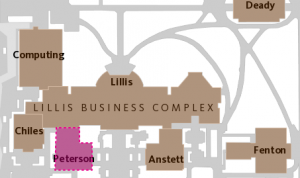 Temporary electric heaters will be provided for rooms 261 & 273 to maintain required warm temperatures. Work will be performed by Hammerquist Mechanical. 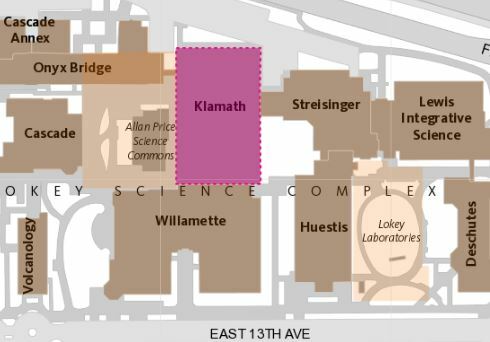 Utilities and Energy need to perform required maintenance on the boiler that provides clean steam for the autoclaves and cage washers located in Streisinger, Klamath, Pacific, ZIRC, LISB, Huestis, Onyx, and University Health Counseling and Testing Center. They are proposing to start March 26th at 7:00 am and end on March 27th at 5:00 pm. If preferred, 60# treated steam is available. Please send Mo a request to let him know you need this. 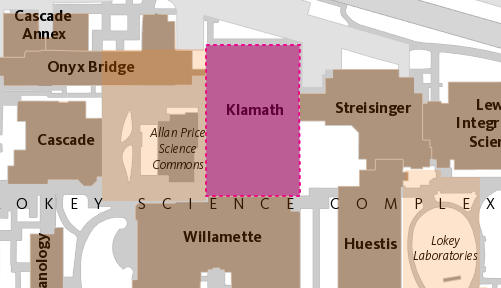 The Office of Design and Construction (CPFM) will be installing a temporary mock-up of collaborative furniture in the Willamette Hall Atrium. This mock-up is being installed for 30 days to help us understand how collaborative furniture groupings are used across campus. This is one of a few places that this furniture will be installed on our campus, with the intent to gather information in regards to how students in our science complex utilize collaborative and informal meeting spaces. These furniture pieces were designed to enhance collaboration and encourage student interaction in active learning spaces. We will occasionally monitor and document student utilization and there will be a survey available via QR code to solicit student feedback on the pieces. We hope that this installation helps to advance the collaborative environment that we strive for on the University of Oregon campus. The existing furniture in the atrium will be shifted to make room for the temporary mock-up. We do not plan to remove any existing furniture, and upon removal of the collaborative furniture, we will return all existing items to their original locations. If you have any questions regarding this notice, please contact CPFM Design and Construction Special Projects & Design Team Manager Maggie Kendall (mgordon@uoregon.edu) at 541-346 -5959. To facilitate an electrical panel relocation in the south wing, we will need to power down rooms 103, 104, and 123 – 129. To limit the disruption, we are planning to complete this work on Saturday, February 3rd from 6 am – 3 pm. Work will be performed by Anderson Construction. For questions or concerns about how this may impact your area, contact Nick Pritchard, Campus Planning and Facilities Management (CPFM) Design and Construction at 346-9139. 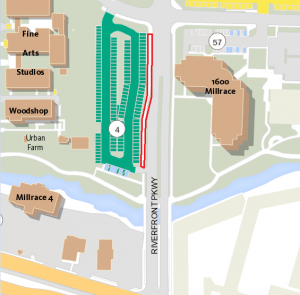 Due to contractor work the sidewalks on the east and west ends of the Thompson University Center along 13th AVE will be temporarily blocked Monday January 15, 2018. Work should be completed by 5:00 pm. For questions or concerns please contact CPFM Facility and Tenant Coordinator Lawrence Elliott at 541-346-5164. Beginning Friday January 12th, 2018 at 4:00 pm, until Tuesday, January 16th, 2018 at 7:30 am, the domestic hot water will be turned off for the weekend and holiday. Users will see low hot water temperatures at break and bathroom sinks. This is due to a faulty steam valve.